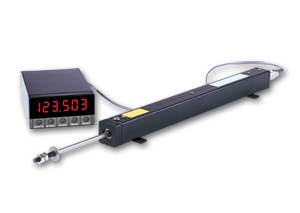 OMEGA's LP801 Series linear potentiometers can be used to measure linear position or displacement up to 1.2 m (48") in a wide variety of manufacturing and process equipment. These units feature front and rear bearings, anodized extruded aluminum housings, stainless steel shafts, and precious metal wipers and contacts for long, trouble-free life in harsh factory environments. Based on a conductive plastic film element, the LP801 provides high resolution, absolute position measurement without external signal conditioners.